As you begin to learn to play the drums, you might find it difficult to know where to start when practicing on your own. Additionally, due to the loud nature of the drums, you may find practicing using a full kit impractical in many situations. Read the following drum lesson practice tips to get a few ideas on how you can improve your drumming technique without having to play a full kit at full volume. Many music store sell practice pads, rubber pads about the size of a snare or a rack tom. The main purpose of a practice pad is to allow you to practice drum rhythms without making any noise. Practice pads typically range in cost from about $15 to $40, and you can also buy a set of foam-like pads to cover all the heads on your kit. If you don’t want to lay out the money for practice pads, you can cover any of your drums or cymbals with a towel or t-shirt to dampen the sound. This comes in handy if you feel like practicing at, say, 3 in the morning while others in your household sleep quietly. 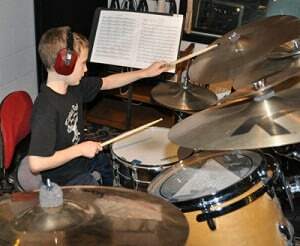 Using a practice pad or simply throwing a t-shirt over your snare works fantastically if you want to practice rhythms. You certainly don’t need to sit down at a full kit to work on getting down those paradiddles, flams, rolls and anything else that you need to know in order to play the drums well. Not only will you enjoy being able to bust out some killer fills once you start getting these down, but you’ll make your instructor happier at your next lesson if you show up having actually practiced the rudiments. If you start getting bored, don’t have your kit, or can’t make a lot of noise, try working with a hand drum. If you want to play out, having some djembe or conga skills will never work against you. A lot of smaller venues can’t accommodate the volume of a full kit. Therefore, many guitarists and singers who play these venues will often specifically request drummers who can accompany them on a djembe or similar instrument rather than a full kit. Working with digital drum software can help you increase your understanding of drumming, timing and music composition. Also, creating drum tracks with a step sequencer, drum machine or music composition software also can provide you with an excellent lesson in how the addition or subtraction of different percussion instruments affect a piece of music as a whole when combined with other instruments. Using these programs allows you to expand your understanding of music beyond drumming alone. Another excellent way to increase your chops is by playing along with your favorite music. This allows you to build the skills necessary to play the style of music you enjoy, and it also allows you to see areas where you need to improve in terms of skill, dexterity and speed. Practicing along with recorded music also gives you the opportunity to talk with your instructor about any problem areas or rhythms you’re just not getting during your next lesson.